Ecce Mulier (behold, a woman's pen name) tagged me with a meme involving listing one's top ten favorite films. Ecce is one of my favorite pseudointellectual bullshitivists (Sid Uberoi, of course, being another) and so I would really like to oblige her. Unfortunately, all I can think about at the moment is the top one film I saw in the past four days. Hopefully that will do. The late Paul Pena, an accomplished blues guitarist--blind from birth--tuned in to a short-wave broadcast of Tuvan throat-singing sometime in the 80s and was mesmerized. He spent the next twelve years learning the nuances of this unique and difficult form of harmonic singing, and also translated texts, one word at a time, from Tuvan to Russian to English via braille to become more familiar with Tuva. 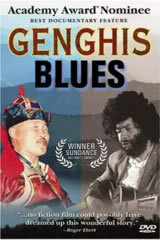 Genghis Blues is the unlikely story of his journey from San Francisco to Tuva to honor and be honored by these remarkable people in their national throat-singing competition. The documentary is a flawed masterpiece--and one of the directors' first attempts at filmmaking--that brings to bear such disparate and compelling topics as the struggles of the Tuvan people to reclaim their identity after being annexed and red-washed by the USSR, the challenges of living blind in a sighted world, and the remarkable kind of homecoming Pena experiences setting foot for the first time in a country many people don't even know exists. We picked this one up from GreenCine--a Netflix spinoff with a more foreign/indie bent--and were captivated start to finish. Categories: Life. Tags: Ten Favorite Films. Poets: Paul Pena.